Bolivia Minister Sticks to Party Line on Foreign Cartel Presence … WTH?! Interior Minister Carlos Romero said “emissaries” of the Brazilian prison gangs Red Command (Comando Vermelho) and First Capital Command (Primeiro Comando da Capital – PCC) are operating in the country, reported El Deber. He also stated there have been examples of Colombian drug trafficking groups sending envoys to Bolivia. The minister added he has seen no evidence of Mexico’s Sinaloa Cartel operating in the country. Those comments were in response to recent reporting by Spanish journalist David Beriain, who said incarcerated Sinaloa boss Joaquín “El Chapo” Guzmán bought cocaine in Bolivia for $2,500 per kilogram and resold it in Mexico for $17,000 per kilogram. “We are very interested to know more about the Spanish journalist’s version, to see how serious it is and also to analyze if it has elements that we could investigate,” Romero said. Romero’s comments hew to the long-held official narrative that foreign emissaries, but not cartels, are active in Bolivia. Security officials have been careful to make this distinction since at least as far back as 2012. 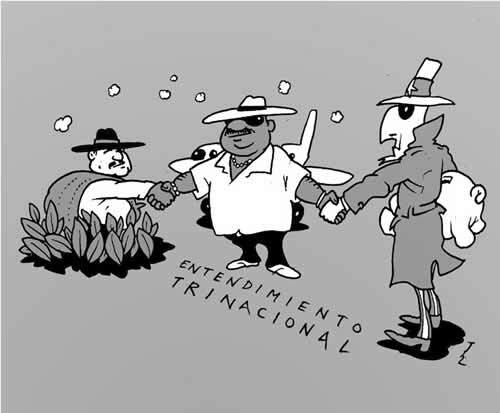 In 2014, Bolivia’s top anti-drug official at the time told InSight Crime that foreign “emissaries have ties with criminal clans” in the country, but stopped short of saying transnational organized crime had taken root. There are, however, indications that foreign drug trafficking groups have a more permanent presence in Bolivia than the party line would suggest. In July 2014, police in Santa Cruz arrested a Colombian accused of establishing an “oficina de cobro,” a criminal structure that has its roots in Pablo Escobar’s Medellín Cartel. The large number of suspects from Colombia — and of other nationalities as well — captured during drug raids also points to a sustained foreign presence in Bolivia. The statements by Romero and others could be an attempt to downplay Bolivia’s role in South America’s drug trade. The Andean nation is both a producer and transit nation for cocaine heading to Brazil, the world’s second largest market for the drug. Bolivia also shares borders with the region’s largest producer of marijuana, Paraguay, and two of its top consumers, Argentina and Chile. Well, what could we expect from a government whose main support and leverage comes from coca leaf producers from a region where more than 90% of that production goes to cocaine?! Under this “government” we have approached dangerous levels of violence, anarchy, smuggling and narcotrafficking … to say there are NO cartels operating in today’s Bolivia is simply absurd and delusional! No wonder there is a perception that Bolivian economy is well … most of the liquidity in Bolivian economics comes from narcotrafficking, money laundering and smuggling … it is a fait-accompli. The government of the coca grower caudillo is turning OUR country into Somalia! This entry was posted in Bolivia, Crime and Violence, Drug war - narcotraffick, Politics, Social Unrest and tagged cocaine production, demagogue, democracy in peril, environmental damage, government failures, Ochlocracy, smuggling. Bookmark the permalink.